We get it, white wine isn’t the manliest of beverages. It tends to be drank by girls wearing floral sun dresses…or middle-aged women on talk shows. We are here to tell you different my friend. So sit back and enjoy our write up on some great white wine’s that we think you’ll enjoy, as well as some great alternative uses for white wine. White wine comes with a reputation. Like pedicures or lifeboats on the Titanic, white wines are thought to be for women. 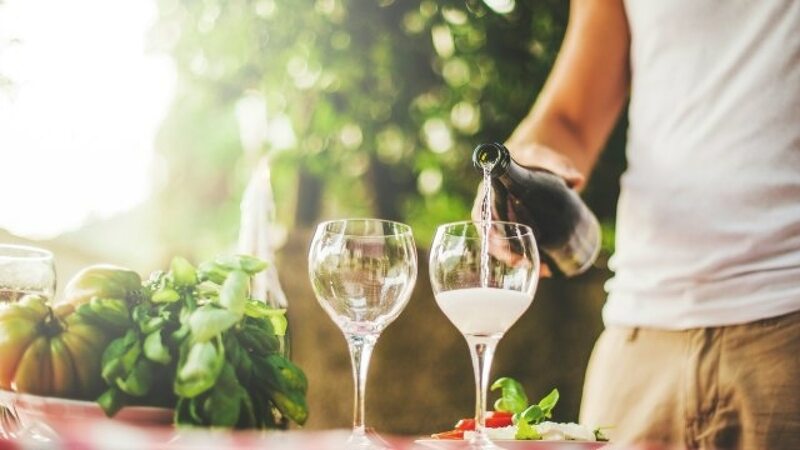 But the times, they are a-changin: Men can drink white wine without fear that their “man card” will be revoked and shredded for pouring themselves a glass of Chardonnay. In fact if you go to most European countries like Italy or France you will see Men regularly drinking red and white wine by the case. There are many white wines for men to drink and still feel manly. And, because white wine is so useful for cooking, making white wine cocktails, or just flat out drinking, men need to familiarize themselves with white wine styles. What’s the big difference between white and red wine? Let’s start with the basics. White wine and red wine are obviously different. From how the wines look, taste, and the body of the wines. There are a few reasons why white and red wines are so different. The grapes used for making white wine are lighter in color than their red wine counterparts. The grapes used for wine are crushed to extract their juice. This is called “must.” Yeast is then added to the juice to start the fermentation process, where the yeast eats the sugars in the grape juice and produces alcohol and CO2. For white wines, skins are removed earlier in this process, before fermentation begins. For red wines, the skins are kept in for longer periods, often throughout fermentation, then removed at the end. Results: The color of the grapes produces different colored wines. And the longer contact between juice and skins during the red wine process adds more color and body to the finished wine. This is why red wines are often “heavier” or more “full-bodied” than white wines. Now we’ll get to the good stuff… what are some great white wines for men to drink? Now we’ll get to the good stuff…what are some great white wines for men to drink? He is worldly, equally as well-traveled as he is well-read. He’s tasted what the world has to offer, and his favorite wines, foods, and movies were discovered while globetrotting, far from the comfort of hamburgers and Bud Light. For The Cultured Man, the perfect white wine is Chablis from France. Chablis is a wine subregion in the Burgundy wine region in northeastern of France. A Chardonnay from Chablis is much different than one from California. It will be dryer, with less sweetness. Chablis Tasting Notes: Citrus and floral smell with a crisp, lean flavor. Pear, minerals, and a little saltiness. Food Pairings: Chicken, seafood, and shellfish. A Quick Wine 101 Lesson! For savvy wine drinkers, there are two very basic types of wine: Old World and New World. Old world essentially refers to Europe and countries like France, Italy, and Germany that have a long history of winemaking. New World refers to countries where wine making is a new(er) practice like the United States, Australia, New Zealand, or South America. Old world countries generally refer to wines by the region in which they’re made. While new world countries refer to wines by the grape the wine is made from. That’s why Chablis is called Chablis and not Chardonnay. Old world winemakers believe that where a wine is made is very important, because it gives the wine distinct qualities. So a Chardonnay made in Chablis will taste different from a Chardonnay made in California, hence the referring to a wine by the region it’s from. This practice is catching on in the U.S. too. You’ll hear it when people talk about a Pinot Noir from Oregon or a Pinot Noir from California. Now, back to the wine list. This man looks to make a strong impression that lasts. He’s confident and capable, and can overpower things that stand in his way. That’s why an Oak-aged Chardonnay from California is perfect for The Bold Man. What does “Oak-aged” Chardonnay mean? Good question! It refers to a Chardonnay that is aged in oak barrels prior to bottling. The barrels give Chardonnay a robust body, and sweet flavors of vanilla. The oak effect is the same thing that gives bourbon it’s sweeter characteristics. And it’s what people are referring to with the term “buttery” when describing Chardonnay. Chardonnay not aged in oak is typically aged in stainless steel instead and tends to have a crisper flavor or “bite”. Of course the type of oak is also important, French, American, or a blend of the two, each one can impart different flavors. 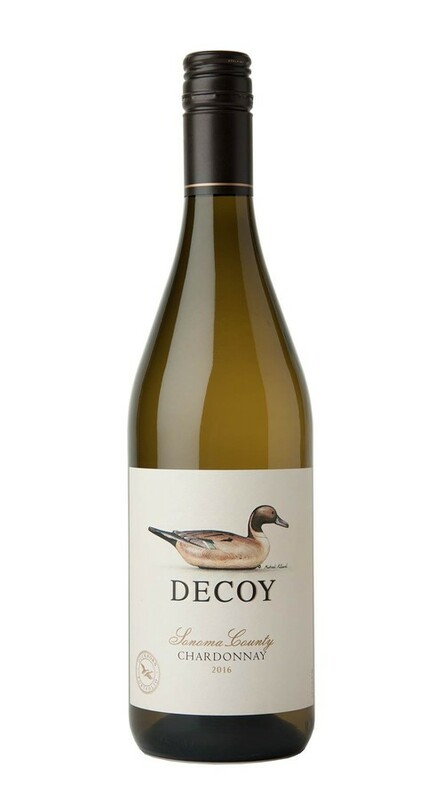 Oak-aged Chardonnay Tasting Notes: Fruit notes of lemon and apple, dessert flavors like vanilla bean and honey. Food Pairings: Soft cheeses, fish with herbs, chicken, turkey. Tasting Notes: Lean and citrusy, with tart pears, chamomile, and slight honey. Food Pairings: It can pair with most any meats, depending on the style you want, but is especially good with the sweet, sour, and spice flavors found in many Asian dishes. This man enjoys the sweeter side of life. Dessert is the most important meal of the day. Unless it’s pancakes for breakfast. The right wine for this man is Riesling. This wine became popular as a German style, but has been growing more popular around the world as new wine regions have cropped up and found a friend in Riesling. In the U.S., Riesling is well known for being grown in the Finger Lakes region of upstate New York., places like Washington with Chateau Ste. Michelle being the most well known, and California producing some great Riesling wines as well. But if you’re looking for a sweeter wine, then you’ll want to stick with the classic German style as the American versions are on the sweeter side but not nearly as sweet. Riesling Tasting Notes: Fruity flavors that can run from lime and apple (dryer styles like New York rieslings) or sweeter, tropical fruits like apricot and pineapple (German styles). Food Pairings: Hearty dishes like duck and pork pair well with Riesling. And its sweetness is a great balance against spicy foods like Nashville hot chicken. He is the younger, impulsive cousin to The Cultured Man. A traveler that prefers hostels to hotels, and isn’t intimidated by a language barrier. The perfect wine for The Backpacker is Vinho Verde from Portugal. Now, Vinho Verde isn’t always a white wine. There are some red wines called Vinho Verde as well. The name translates to “young wine.” But the white varietals are what you’ll mostly find in the States. This is a fun, bright wine that can surprise you. Because it’s a young wine, Vinho Verde hasn’t finished aging, and it’s still fermenting after bottling, so it has a slight bubbly effervescent that runs shy of turning it into a sparkling wine. Vinho Verde Tasting Notes: Fruity and floral, similar to a Pinot Grigio. There are also “green” notes like grass and green bell pepper that give it a vegetal funk. Food Pairings: Sushi is an ideal pairing for Vinho Verde. Now that we’ve discovered white wines that men want to drink, let’s take a look at some other uses for white wine. It’s a versatile beverage that is great for cooking, and has some surprising uses. This is one of the greatest kitchen inventions. It’s a delectable sauce for baked or grilled white fish. It also makes for a wonderful pasta sauce that is a nice chance of pace to the half-empty bottle of Prego squatting in your refrigerator. Having this recipe in your toolbox is a must for any good home chef. And it requires that you keep a bottle of white wine on hand. If you have the tastes of The Cultured Man, then you’re in luck, because Chablis is the best white wine for cooking and making this garlic-butter white wine sauce. Check out this recipe from Epicurious for a delicious Garlic-Butter White Wine Pasta dish. The Backpacker has definitely downed a few Aperol spritz while trekking through the outposts of Italy. It’s a wonderfully refreshing and low-ABV cocktail. Wine freezes at a lower temperature than water, but most home freezers will do the trick. Pour off a bottle of wine into an ice cube tray and stick it in the freezer. This is great for having wine on hand for cooking, especially if you don’t have extra space in the fridge to keep a bottle on hand for cooking. It’s also a good trick if a friend brings over a bottle of white wine and you don’t want to wait until it chills to drink it. Just drop a cube in and enjoy. Sangria is a wine cocktail that is is a life (and fruit) saver for when you’ve forgotten about the fruit in the produce drawer of your fridge. Before the fruit turns, just cut it up and make Sangria. You can make a quick Sangria with white wine and Sprite, or even a few cans of citrus La Croix. If you’re going the sparkling water route, just make sure to add in some extra sugar if you want it sweeter. Mix your white wine, sprite, and add your (once) fresh fruit. White Wine Sangria is a perfect cocktail for The Sweet Guy. Yes, you can remove grease stains with white wine. The alcohol can break down grease to help ease clean up. Though we recommend drinking the white wine and just investing in some degreaser. We hope you enjoyed this lesson on white wine for men, let us know your thoughts in the comments on white wine and which ones you enjoy as a manly man.